Go to Settings, System Settings, System Information. Hold L + R + Left + Square for at least three seconds. Release those buttons, then immediately hold Start. The firmware's build date can be found in the second-to-last line of information (in the case above, the build date is October 10, 2008). The extra information will disappear once Start is released, unless Left is pressed before releasing. 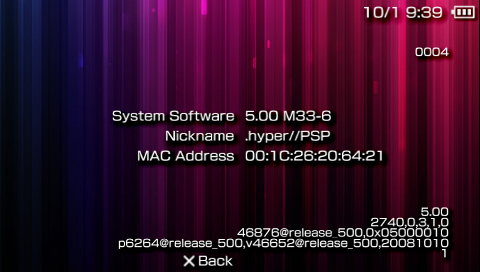 This info is said to exist in the PS2 and PS3 as well, but may have been removed from some later firmwares. This page was last modified on 5 November 2018, at 02:36.